The chronic kidney disease (CKD) constitutes a renal structural change (glomerular, tubular and endocrine) that is commonly progressive and irreversible and implicates in reduction or limitation of kidney’s ability to filter, therefore causing uremia (elevated levels of urea) characterized by accumulation of substances in the blood, which must be filtrated and expelled by kidneys. Uremia provokes immunodeficiency due to the increase of toxic substances in the bloodstream, therefore, patients with this disorder have suppression of humoral and immune responses. 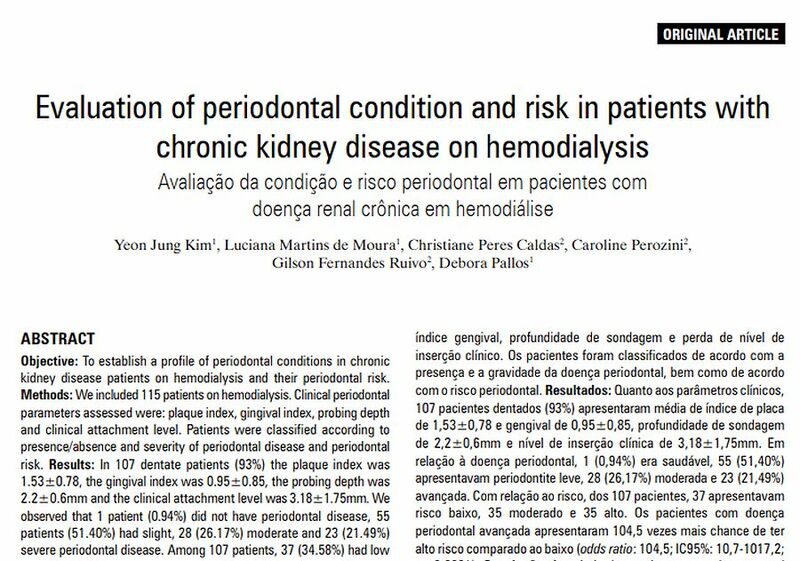 Some oral manifestations of CKD can be seen, such as xerostomy, uremic stomatitis, radiographic changes in maxillary bones and formation of dental calculus. 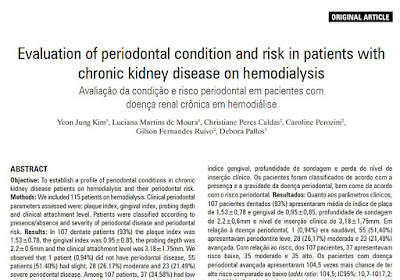 In Brazil, there is an estimation of 499 patients per million on dialysis treatment, according to the census issued by the Brazilian Society of Nephrology in 2013, and CKD is considered a public health problem. A number of causes are associated with renal failure. The most common causes are diabetes mellitus, blood hypertension, chronic glomerulonephritis, polycystic kidney disease, among others. Around 61% of patients whom underwent dialysis had diabetes and hypertension. 1 Universidade de Santo Amaro, São Paulo, SP, Brazil. 2 Universidade de Taubaté, Taubaté, SP, Brazil.